The Roman persecution of Christians began during the reign of Nero (see Nero Persecutes the Christians, 64 AD) and persisted until Christianity was recognized as a legitimate religion by the Emperor Constantine 249 years later. This persecution was justified by the belief that the Christians' refusal to pay homage to Rome's pagan gods provoked their wrath. The disastrous consequence of a flood, drought, earthquake, or other calamity, was often attributed to the Christians' lack of piety and the resultant retribution of the gods. Christians were denounced as enemies of men and the gods and therefore subject to the severest tortures. Conviction did not lead inevitably to execution. Pardon would be granted if the Christian threw a few grains of incense on the altar of the pagan god and thereby recognize its dominance. If this offer was refused, more severe measures such as scourging or other tortures were implemented. If these failed, the victim was led to the circus or theater and subjected to a horrible death for the amusement of the crowd and the placation of the gods. Vibia Perpetua was a young woman of noble birth. She was twenty-two, a wife, a mother of a young son and a Christian. In the city of Carthage in North Africa on March 7 of the year 203 she was put to death for her religious convictions. Her story comes to us from three eyewitness accounts written shortly after her death. Perpetua was one of five Christians condemned to death in the arena. One of her companions, Felicitas, was a slave and eight months pregnant. Two days before her execution she gave birth to a daughter. Pepetua's father was a pagan and came often to the prison (many times with Perpetua's son in his arms) to plead with his daughter to renounce her religion and save her life - to no avail. On March 7 Perpetua and her four companions were led to the arena where the crowd demanded they be scourged. Then a boar, a bear and a leopard were loosened upon the men while the women were attacked by a wild bull. Wounded, Perpetua was then put to the sword. "When I was in the hands of the persecutors, my father in his tender solicitude tried hard to pervert me from the faith. So he went away, but, on the rumor that we were to be tried, wasted away with anxiety. 'In this trial what God determines will take place. We are not in our own keeping, but in God's.' So he left me - weeping bitterly. [Perpetua and another Christian woman, Felicitas, were tossed and gored by a bull; but despite cruel manglings yet survived. Perpetua, says a sympathizing recorder] seemed in a trance. 'When are we to be tossed?' she asked, and could scarcely be induced to believe that she had suffered, in spite of the marks on her body. [They were presently stabbed to death by gladiators] after having exhorted the others to 'stand fast in the faith and love one another,' she guided to her own throat the uncertain hand of the young gladiator." Perpetua's account appears in Davis, William Stearns, Readings in Ancient History vol. II (1913); Duruy, Victor, History of Rome and the Roman People (1883); Gibbon, Edward, The History of the Decline and Fall of the Roman Empire (1896-1902). 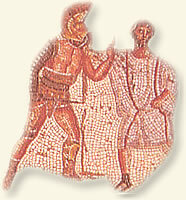 "Death of a Martyr, 203 AD" EyeWitness to History, www.eyewitnesstohistory.com (2004).